Celebrating Mardi Gras? 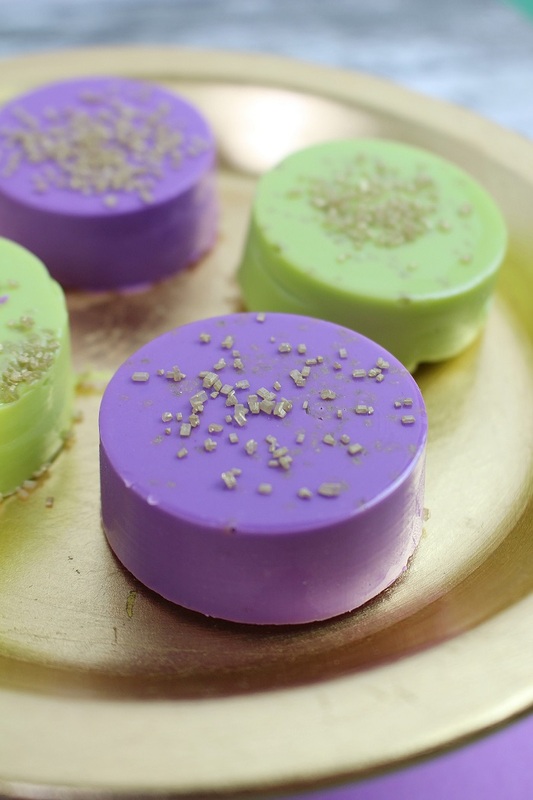 Move over King Cake…this amazing New Orleans inspired dessert is worth adding to your party menu: Mardi Gras Chocolate Covered Oreos! 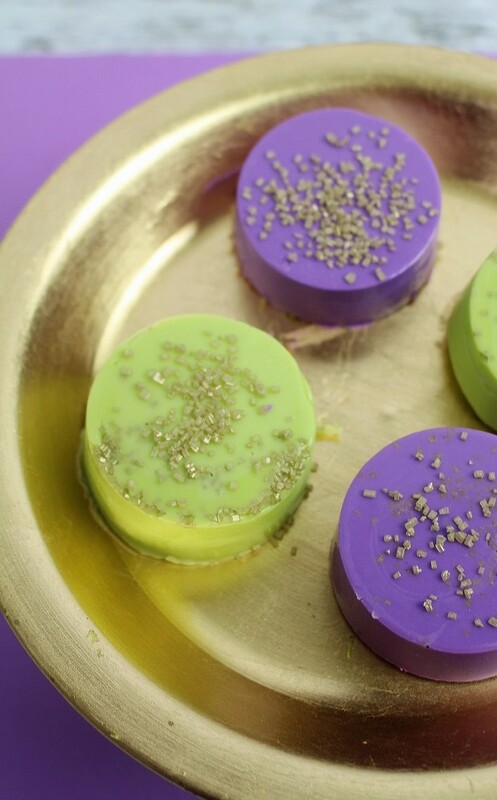 Fat Tuesday is February 9th this year, so there’s plenty of time to get the supplies needed to make this decadent dessert for your party guests! 2. In a double boiler pan, melt 1 tablespoon solid shortening. 3. Add 1 cup purple chocolate melts to the shortening and stir until completely melted. 4. Pour 1 T of the melted chocolate into each mold to cover the bottom entirely. 5. Place an Oreo into each mold, on top of the melted chocolate. 6. Using a Tablespoon, pour more melted chocolate on top of the Oreo until the mold is full. 7. Refrigerate for one hour. 8. Repeat steps 2-7 using 1 T solid shortening and vibrant green chocolate melts. 9. Remove candy molds from refrigerator after one hour. 10. Gently press down on the molds to lift the cookies out onto the baking sheet. 11. Sprinkle each cookie with gold sugar crystal sprinkles and enjoy! 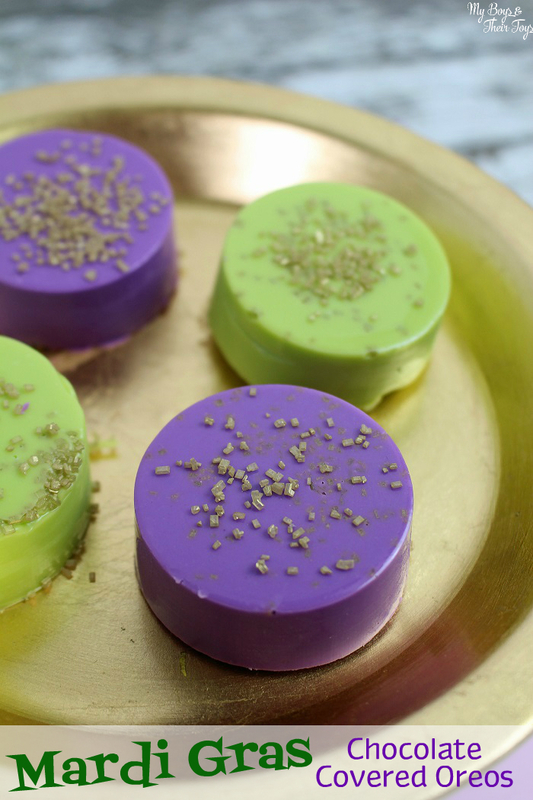 Not only do these Mardi Gras dessert cookies look festive, but they taste amazing too! Yum! How will you be celebrating Mardi Gras this year? Oh, yum. I had gourmet chocolate covered Oreos several years ago at an event. That was back before people made them at home. They were to-die for. Never occurred to me that I could actually make them. (Thank goodness… otherwise I would be much heavier!) Thanks for the tips on how to do it the next time we have a special occasion. This is a cute idea – you could use different melts for various holidays – and so easy and inexpensive, too! These would be perfect for so many events/holidays. I love how smooth they are. I like this colorful cute idea. Kids would love this. Too cute! Love bite-sized little treats. These look so pretty and what a clever idea I would love to make these for the kids.